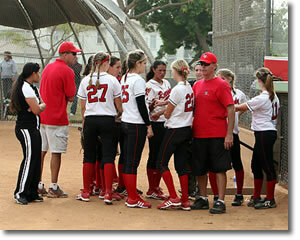 Welcome to the 18U Gold San Diego Renegades team coached by Mike Fox. 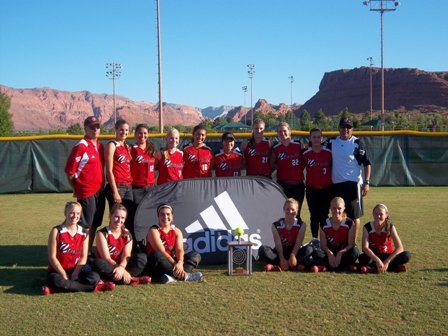 This young team has compiled an impressive resume of accomplishments including a 9th place finish at 2007 ASA 18U Gold Nationals in Oklahoma, the highest finish from a San Diego Renegades team at ASA Gold Nationals. Prior to that, the team placed 5th at 2006 ASA 16U Nationals in Seattle, and many of these same players were members of the PQ Lightning All-Star team crowned as Champions at 2004 ASA 12U-B Nationals in College Station, Texas. 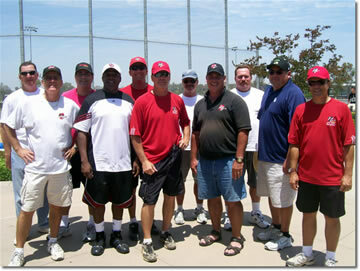 Practices and workouts are held at Canyonside Community Park, in centrally located Rancho Peñasquitos in San Diego. To find out more about the team, please contact the coaches. Sashel Palacios, a 2013 right handed catcher/3rd basemen, who hits from the left side, has verbally committed to continue her education and softball career at Arizona State University. 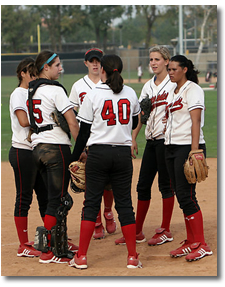 Sashel will join former San Diego Renegades Alix Johnson on the 2011 National Champions. Sashel joined the Renegades in 2011 and was quickly recognized as a top recruit receiving attention and offers from several Division 1 top softball programs. Her ability to control the game behind the plate with her quickness, blocking abilities, and strong arm were recognized by all that watched her. Sashel helped the 16u Renegades this last summer to one of there best finishes in Renegades history. She helped lead the team to a 4th place finish in Colorado, 3rd place in the 16u Champions Cup, a 1rst place finish in the adidas Futures National tournament, and a 3rd place finish in the 16u Premier Nationals. Sashelâ€™s desire for the game, great attitude, and work ethics will serve her well as she continues her career with the Renegades and prepares for her college career playing with the National Champions Arizona State Sun Devils. Congratulations Sashel! Hannah Flippen, a 2013 SS/2B has verbally committed to continue her education and softball career at the University of Utah. The Utes will open up their inaugural season in the PAC12 this year under head coach Amy Hogue. Hannah is a gifted athlete who displayed her skills this summer drawing attention from many of the top schools. Hannah&#039s leadership on the field was a key to the success of the 16u Renegades this last summer leading them to a 4th place finish in Colorado, 3rd place in the 16u Champions Cup, a 1st place finish in the Adidas Futures National Tournament, and a 3rd place finish in the 16u Premier Nationals. Hannah plays the game with heart, has great hands, a strong arm, and the ability to get on base by hitting with power and playing small ball and using her speed. These attributes and skills will be a great fit for the Utes. Congratulations Hannah! GO Utes! Gretchen Aucoin, a RHP/1B/3B, Ocean Springs, MS (Ocean Springs HS), has signed with the Texas Tech Red Raiders of the Big-12 conference. Gretchen was invited to play with the San Diego Renegades Organization through Coach Mike Fox&#039s daughter Texas Tech&#039s Assistant Coach Kristie Fox. Gretchen is considered one of the top pitching prospects in the country…a hard throwing right-hander who has been clocked in the upper 60&#039s…bats left-handed with power to all fields…athletic with smooth and graceful defensive skills…played as a guest player for the 18U Renegade team…helped the 16U Renegade team achieve Premier Qualifying Champion status and finish third at the 2011 16U Premier Nationals in Huntington Beach, California…Gretchen is expected to help the Red Raiders boost their pitching staff with another power pitcher to keep pace with the Big-12 conference softball powers…Gretchen is methodical, mentally tough, and country strong…Gretchen shows a quiet command of her pitching and hitting emotions as well. Texas Tech Head Softball Coach Shanon Hays describes Gretchen, “as a fantastic athlete at 6&#039 0&#039&#039 tall who runs well, throws hard, with left-handed hitting power…she&#039s a kid that has tremendous upside and one of the most talented kids I&#039ve ever recruited…We expect her to make an impact as a pitcher and hitter in the Big-12 conference for years to come. 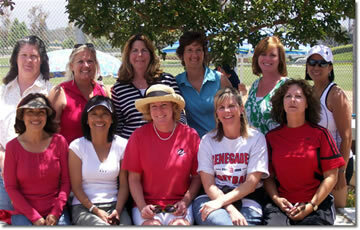 Gretchen would like to thank all the coaches, players, parents, and friends (brothers and sisters) of the San Diego Renegade Organization for an unforgettable 2011 summer of success, fun, and most of all friendship. Thank you for accepting a Mississippi girl as one of your own. Congratulations to the San Diego Renegades (Fox) 16u team for finishing tied for 3rd in the Premier Girls Fastpitch tournament this last weekend. The team had an impressive run losing in the what-if semi-final game in an international tie breaker to the Firecrackers, the eventual champions. This loss to the Firecrackers was the first loss of the year for this team, having an impressive record of 3 wins, 1 loss, and 1 tie against the Firecrackers who will undoubtedly be ranked number one in the final season polls. Congratulations to the San Diego Renegades (Fox) on winning the 2011 adidas Futures National Championship. These players exemplified courage, strength, and perseverance to carry out the adidas Futures mission. be held locally in Poway and Santee. 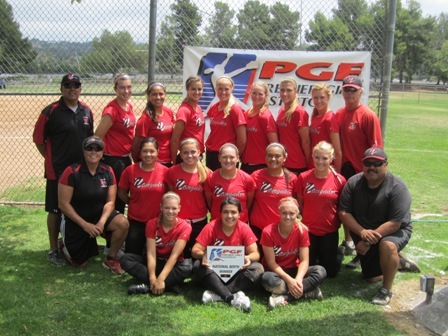 qualifying berth in 2011 16U Premier Girls Fastpitch (PGF) Nationals. as Premier Nationals will be held in Huntington Beach. Nina Villanueva, a senior first baseman/outfielder has signed with Cal State Monterey Bay to continue her education and softball career. Playing in the California Collegiate League, Nina will be completing against several current and former teammates/Renegades; Monique Portugal (UC San Diego), Vanessa Currie (Sonoma State), Lauren Harper (Dominguez Hills), and Jessica McDermott (Chico State). Congratulations Nina! Danielle Cowan, a junior pitcher/1B from Carlsbad High School, has verbally committed to play at the University of Buffalo. It will be a Renegades reunion, as she joins former Renegades teammate Sammi Gallardo and her current Renegades catcher Alexis Curtis at Buffalo. Defensively, Dani has great command in the pitchers circle, where her tight spin and good movement make it difficult for opposing hitters. Dani shows very little emotion in the circle and is aggressive in the zone. She also plays a solid 1st base and can hit with power. Her intensity and love for the game will serve her well in Buffalo. Well done, Dani! Taylor Hallahan and Haley Croce, have both announced they signed with Vanguard University. Set on a beautiful campus in nearby Orange County, Vanguard is a competitive NAIA school in the Golden State Athletic Conference. Taylor, a 2010 speedy outfielder from West Hills High School, will give the team a lefty slapper as well as an aggressive outfielder. Haley, a 2010 shortstop from Clairemont High School, has the versatility to play nearly every infield position, as well as the outfield. The Vanguard coaches loved the positive attitude and athletic ability of both girls. The Renegades organization wish both of you the greatest successes. Congratulations on your achievements! Stephanie Higgins, a versatile corner infielder and corner outfielder from Mission Hills High School, has committed to Western New Mexico University. Located in historic Silver City, adjacent to the Gila National Forest, WNMU competes in the Rocky Mountain Athletic Conference. The coaches loved her athleticism playing both 1st and 3rd as well as OF, and were impressed with her solid hitting. After her recent official visit, Steph knew that the campus and the players would make this the perfect fit for her. Always smiling, her wonderful attitude and tremendous work ethic will lead her to great success. Congratulations on all your accomplishments, Steph! Vanessa Kellems, a speedy outfielder from Steele Canyon High School, has verbally committed to South Dakota State University (the “other” SDSU) in Sioux Falls, South Dakota. South Dakata State plays in the Summit League Conference along with North Dakota State, where Vanessa&#039s former Renegades teammates Amanda Grable and Whitney Johnson will be attending. This is a great accomplishment that Vanessa has worked very hard for. She loved the Sioux Falls area and the current players welcomed her with open arms. It should be a great experience and we congratulate you and your family. Great job, Vanessa! Monique Portugal, a versatile 2010 2nd baseman/outfielder from Westview High School, has agreed to continue her softball career at UC San Diego. Monique&#039s athletic ability, coupled with her excellence in the classroom, has allowed her to be able to play locally while attending one of the most prestigious schools in the state of California. Mo is a sure-handed fielder with excellent fundamentals, and the UCSD coaching staff loved her consistency at the plate. Her work ethic, both academically and athletically, will help her succeed in all that she does. Congratulations, Mo! travel ball coach. With this designation, Coach Fox will select up to 15 players ages 14-18 to make up an adidas Futures National Team who will compete at the 2011 adidas Futures National Tournament in St. George, Utah on July 20-24, 2011. For more details, please watch this video and visit the adidas Futures website. Nikki Barba, a senior shortstop/catcher from Mt. Carmel High School has verbally committed to Quinnipiac University in Hamden, Connecticut. Quinnipiac is an NCAA D-I school that plays in the Northeast Conference. She&#039ll join the same conference as former Renegades Kaitie Schmacher (Monmouth) and Lauren Morizi (Long Island University). Nikki has tremendous athletic ability and quickness allowing her to excel at multiple positions. She&#039s a knowledgeable ballplayer and fierce competitor who calls a great game behind the plate. Offensively, she possesses the rare combination of hitting for both power and average. Congratulations, Nikki! Kaitie Schumacher, a 2010 senior from Scripps Ranch High School, has committed to play her college ball at Monmouth University. Kaitie displayed her versatility as a defensive player, with the ability to play either corner position and outfield if necessary. She has delivered many times as a clutch hitter. At 2009 18U Nationals Kaitie hit a walk off home run in the bottom of the seventh to beat the Texas Royals. Congratulations, Kaitie!! Alexis Curtiss, a junior catcher/3B from University City High School, has verbally committed to play at the University of Buffalo. She will join current teammate Sammi Gallardo at Buffalo and former teammates Amanda Carpenter, Lauren Gellerman, and Shannon Tillett in the Mid-American Conference (MAC). Alexis joined the Renegades (Tillett/Fox) team, in the Fall of 2008. Defensively, her blocking and intelligence behind the plate drew the attention of many colleges. While offensively, she is a consistent hitter that will put the ball in play and make things happen. Her great work ethic and passion will bring her great success at Buffalo. Congratulations, Lex! Gabrielle Sciuto, a senior pitcher from Poway High School, will be attending University of Redlands. Gal joined the Renegades in 2007 and showed her talent in the circle by leading the team to 16U ASA Nationals. Gal has great command of her pitches and is a leader in the circle. Redlands was among several colleges following Gal over the last year. Gal visited the school and fell in love with the coaching staff, campus and facilities. Congratulations, Gal. Your determination and hard work have served you well. Brie Austin, a senior shortstop from West Hills High School, has committed to play at Arizona Western Junior College in Yuma, Arizona. In her 3 years playing for the Renegades, Brie has proven herself as an athletic versatile player with the ability to play middle infield, third base and outfield. At the plate Brie hits for both average and power. On her recent visit to Yuma, she loved the campus and coaching staff. Congratulations, Brie! Gabby Clement, a senior second baseman from University City High School, has chosen to stay local and verbally commit to Cal State University San Marcos. She will bring a power to the Cougars lineup. She joins a series of former Renegades that include Brenna Sandberg, Ashley Estepa, Chanel Rose, Holly Russell and Melissa Lerno. Congratulations and best of luck to you Gabby! Alex Miller, a senior outfielder from West Hills High School, will be staying local to play softball for Cal State University San Marcos. Alex will join former Renegades Alyssa Dronenburg, Brenna Sandberg, and Ashley Estepa. Alex joined the Renegades in 2008 and showed her athleticism and talent in both center field and shortstop with a very strong arm and great range. At the plate, she brings both power and speed with the ability to steal bases. Congratulations, Alex. Your hard work and dedication have paid off. Sammi Gallardo, a versatile senior infielder from Otay Ranch High School, will be crossing the country to play softball for the University at Buffalo. Sammi will join former Renegade, pitcher Terese Diaz. In her 3 years for the Renegades, Sammi&#039s athletic ability has allowed her to play all infield positions except pitcher/catcher. At the plate, she&#039s a solid contributor who can hit with power. On her recent visit to Buffalo this Fall, she loved the campus, and she felt the team has a great family atmosphere. The Buffalo coaches are impressed with Sammi&#039s versatility and terrific attitude and are thrilled to have her join the squad in 2010. Congratulations, Sammi! Directions: Take 15 to Rancho Penasquitos Blvd. go west to Calle de Las Rosas turn left (top of hill). Then turn right on La Tortola and park will be at bottom of hill on Right. Congratulations to the San Diego Renegades Tillett/Fox team for qualifying for Gold Nationals at the ASA Region 14 Qualifier in Hemet, California. The team went undefeated over the weekend and now can look forward to competing against the premier Gold teams in Oklahoma City in August. Congratulations to the San Diego Renegades Tillett/Fox team as they went undefeated in the ASA Gold Classification tournament in Fontana. 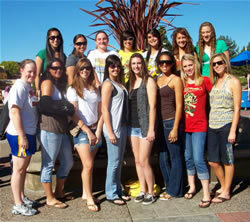 They are now classified as an 18U-Gold team and will look forward to competing in the summer Gold qualifiers. Natalie Camarda, a senior standout pitcher from The Bishops School, will make the cross-country move to New York to play softball at Adelphi University. Natalie has great command of her pitches and always shows tremendous poise in the circle. Adelphi was among several colleges following Natalie at the fall Showcases. She had wanted to move to the East Coast for school, enjoyed her recent campus visit, and loves the proximity to New York City. More importantly, Natalie currently studies Chinese language, and Adelphi has an excellent Asian studies program. We are very proud of you, Nat. Well done! consistent hitter, who is always among the team leaders in slugging. love of the game. Congratulations, Kellie! off to a great start. Way to go, Megan! they were continually impressed with her attitude and mound presence. her to excel in the competitive Pac-10. Congratulations, Alix! happy to welcome her to the Renegades family. San Diego Renegades Gold will be holding an invitational tryout on Sunday, August 17, 2008. The tryout will be held at Views West Community Park in Rancho Penasquitos from 12:30 – 4:00. If interested, please send your profile to Duane Tillett @ duane.tillett@gat.com or if you have any questions please call c) 858-442-0159 w) 858-455-2072. Isela Mohr, a senior OF from Serra High School, has signed a national letter of intent to play for Howard College (JC) in Big Spring, Texas. Congratulations, Izzy — we know you will do great in college. The team stepped up and impressed at the Champions Cup. After going 4-2 in pool play, the team stormed through the winner&#039s bracket until reaching the semi-final game where they fell to the California Cruisers. Great job, ladies! Congratulations to Kellie Fox for being selected to the 2008 All American Under Armour Team. From 300,000 high school softball players nationwide, only 30 players were selected by a committee made up of the nation&#039s most knowledgeable figures in high school softball. The players competed in the Inaugural Under Armour® Softball Game telecast on ESPNU. Way to go, Kellie! Christina Datko, a senior OF from Scripps Ranch High School, has signed with Eastern Kentucky University to continue her softball career. While there, she will be roaming the outfield grass with former Renegade Cassie Gibson. Congratulations, Christina! The team played in the ITSA/Cruisers Summer Challenge taking third place. On Father&#039s Day, many families took the trip north to Irvine to be with Dad on his special day. Cassi Gibson—Cassi followed another former Renegade player, Katie Ralf, to Eastern Kentucky. As a freshman, Cassi started 46 of the 49 games and ended her season with a .305 batting average. Brenna Sandberg—Brenna pitched for Cal State San Marcos and ended her freshman campaign with a 9-7 record. She pitched 102 innings with a 2.18 ERA and held her opponents to a .240 batting average. We are looking forward to having Brenna out to our workouts to stay in shape and to pitch batting practice. Melissa Tillett—Mel started her freshman career in 2008 at Northern Iowa discovering that she needed back surgery. She red shirted this year and is now back and ready to prepare for her red shirt freshman year in 2009. Mel finished her freshman year with a 3.58 GPA. Congratulations to former San Diego Renegades teammate Nikki Ketteringham for being named a 2008 NFCA Division II All-American, California Collegiate Athletic Association&#039s "Freshman of the Year" and All-League team at during her freshman year at Humboldt State. Humboldt State is the 2008 Division II National Champions. Way to go, Nikki! Anita Green, a senior 2B/OF standout from Calvary Murrieta High School, has joined high school friend, teammate, and fellow Renegade Tory Ferreira, in signing a national letter of intent to play for California Baptist University in Riverside. At the 18U level, Anita played for the Cal Cruisers and Sudden Impact prior to joining our San Diego Renegades family in the fall of 2007. Congratulations, Anita — we wish you the best as you continue at the collegiate level. Shannon Tillett , a junior 1B/catcher from Mira Mesa High School has verbally committed to play at Miami University of Ohio. Shannon is one of the inaugural members of the Tillett/Fox Renegades team and has been the team&#039s first baseman and cleanup hitter ever since it was formed at 14U. While her primary position is 1B, she is also an accomplished catcher and can play 3B as well. As a pure hitter, Shannon drew the attention of many scouts, including the Miami of Ohio coaching staff, at the 2007 Colorado Fireworks with her consistency and power to all fields. Miami followed her as she continued to hit for average and display power at Gold Nationals, the fall Team New Jersey showcase, and at the final Batbusters Surf City fall showcase. Miami was impressed by her work ethic, sportsmanship, and knowledge of the game. She also takes pride in her studies which will help her excel at Miami. getting noticed at the 2007 Colorado Fireworks and at Gold Nationals. attitude will help her succeed when she gets to Ohio University. Amanda Ziegler, a versatile senior from Westview High School, has signed a national letter of intent to play for UC Santa Barbara. She plays a solid 3B, has great range at 2B, and has the speed to play outfield. She is also a good contact hitter with power from the right side. 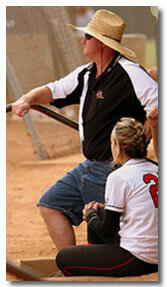 Amanda has impressed many scouts since she joined the Renegades (Tillett/Fox) team in the fall of 2006. As a 2B on previous Renegades teams, she easily made the transition to 3B filling a need for her new team. UCSB had always been her dream school: both her parents are alumni and her older sister plays softball there as a Shortstop. 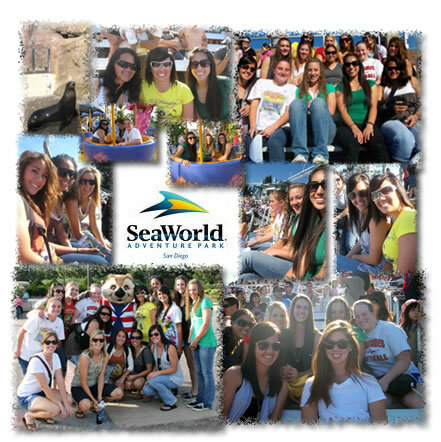 Santa Barbara had been following Amanda at Colorado Fireworks and again at Gold Nationals this past year. As one of the longest tenured San Diego Renegades players, the entire organization congratulates Amanda on her success of getting the rare chance to follow her dream. Amanda Carpenter, a junior outfielder from Santana High School, has impressed many scouts since she joined the Renegades in the fall of 2006. After visiting the beautiful Ball State University in Muncie, Indiana, she is excited to announce that she verbally committed to play there for head coach Craig Nicholson. Ball State first noticed her at the 2007 Colorado Fireworks, saw her compete at 2007 Gold Nationals, and saw her hit a home run over the fence at the 2007 Team New Jersey showcase. As a natural lefty, her speed and her ability to both slap and hit for power had also drawn the attention of many schools. Her hard work and great attitude will help her succeed at Ball State and in the future. Congratulations, Amanda! Read what East County Sports wrote about Amanda. has signed a national letter of intent to play for California Baptist University in Riverside. Tory joined the team at 2007 Gold Nationals where she helped the team achieve a 9th place finish. Her command and variety of pitches, which includes a knuckle change, will help her succeed at the collegiate level. Congratulations, Tory! one of the first to notice her in 2006 at 16U Nationals in Seattle. successfully in the powerful Pac-10. Well done, Maggie! month in St George, Utah. the college level. Congratulations to the seniors! this point and we are all very proud of her and this achievement. of the scholarships you&#039ve received!